Latvia, a small Baltic country with a full EU and Schengen zone membership, offers an uncomplicated investment residency program for yourself and your family. You will have visa-free access to all 26 countries of the Schengen zone, access to state education and health care in Latvia, and the right to live and work there. There is no physical residency requirement, however, and you can enter and leave the country as many times as you like. As soon as your residence permit is granted, your spouse and dependent underage children can also receive residence permits based on the family reunification procedure. You will be awarded a 5-year temporary residence permit, which you can extend without additional investment. You do not need to physically live in Latvia, the only requirements are that you have a registered address and spend at least 1 day per year there. After 10 years of legally residing in the country, you will be eligible for citizenship. You and your family will have visa-free unlimited travel within the Schengen zone in Europe. 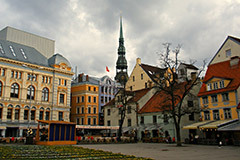 There are three options for obtaining investment residency in Latvia. First, you can buy real estate in Latvia for at least EUR 250,000. The second option is an interest-free government bond, also with a minimum requirement of EUR 250,000. Finally, you can invest in a bank bond for a minimum of EUR 280,000, and receive interest on your investment. All investments have to be retained for a 5-year period. A government fee of EUR 25,000 is payable for the government bond and bank bond options.